Home / Beauty Secrets / Beauty Tips / DIY Beauty Product / Glowing Skin / Hair / Skin / How can we use Strawberries as a beauty ingredient? How can we use Strawberries as a beauty ingredient? Today I shall share some strawberry beauty tips for you! Those pretty little berries do more than just please our palates: they clear up acne and oiliness, make skin younger and smoother, whiten teeth, and reduce under-eye puffiness, leave hair glossy and beautifully conditioned, and so much more! Generally Use these 6 ways to incorporate the beneficial and natural effects of strawberries into my beauty routine. Strawberry juice contains multiple compounds and antioxidants which work to refresh your skin cells, and help you to achieve a healthy glow. This is especially a great idea when your skin appears dull. For an easy refresher at any time, take a strawberry and make a paste. Add 1 tsp of honey and then rub the paste over your face, applying a thin layer of the paste to your skin. Leave on for a few minutes and then rinse off with cool water. The results are amazing and you’ll notice how this works as a great pick-me-up at any time of day. Forget about artificial strawberry smell, you can get the real thing by making your own body scrub.Mash up 6-7 strawberries, 2 tablespoons of olive oil, and 1 teaspoon of brown sugar. Mix all the ingredients together to smooth paste and then apply the paste to your body as well face. Massage gently with the scrub for a few minutes. Let sit for a few minutes for the oil and strawberry to penetrate thick skin and then rinse off and follow up with a moisturizer. This strawberry scrub works to get rid of dry, dull skin and helps new skin cells to regenerate while also providing moisture and helping your skin to achieve a healthy glow. 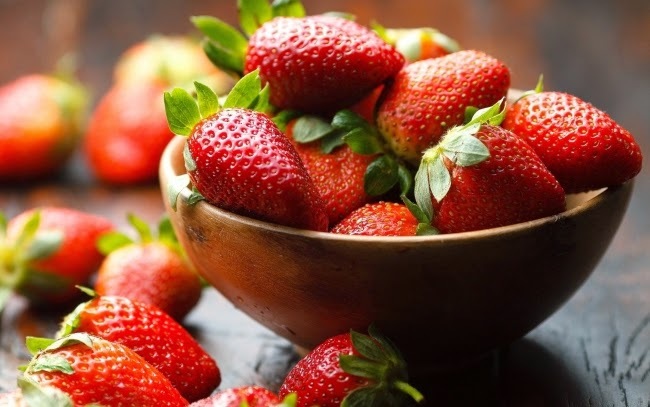 If you struggle with acne, strawberries can help to decrease breakouts. Simply apply a thin layer of the strawberry juice to your skin face. Leave on for 10 minutes. Rinse off and use this remedy twice a week for the best results. You just need to take a small amount of strawberry pulp and rub it on your teeth for five minutes. After doing so, you can rinse your mouth out very well and use dental floss to take out any seeds that might have gotten caught in your teeth. You can also mix a little baking soda into a strawberry mix. Mix equal parts fresh strawberries and plain unsweetened yogurt, mashing to combine. Apply to face, allowing to stay on for around 10 minutes, Rinse. Mash ingredients thoroughly and massage into damp hair. Cover with a shower cap and a warm towel. Allow to stay on hair for at least 15 minutes, then shampoo as usual.